Internet of things – the technology that connects ubiquitous devices – is rapidly being adopted across all industry verticals -from retail, healthcare to manufacturing. Devices like sensors, wearables, thermostats, TVs, and cars are interconnected by Home Automation IoT; while IoT platforms that virtualize a physical system are being used in manufacturing. Enterprise organizational systems like ERP and CRM are also leveraging IoT to streamline their workflows. As a result, a huge amount of data haul from diverse devices is now possible. The communication between IoT devices is currently centralized – through message brokers that send aggregated data to Cloud. A man-in-the-middle and fake device security attacks can therefore be easily connived to disrupt IoT services. Steering clear of information attacks and physical tampering is a question that looms large on the IoT horizon. The recent DDoS attack on a DNS provider that affected Twitter, Netflix, PayPal, and NYTimes across the US was initiated through an IoT malware called Mirai botnet. Centralized Cloud servers will be prone to security failures as the IoT ecosystem grows exponentially. Also, IoT uses primal operating systems and simple processors. This makes IoT setups vulnerable to security breaches, as they do not support the latest security solutions. The obvious solution to make an IoT setup robust and secure is to have a decentralized communication module that allows distributed file sharing, peer-to-peer messaging and has independent device co-ordination. Blockchain – a distributed database – is the most appropriate technology that solves this problem. The success of bitcoin for exchange of cryptocurrency in financial services is an irrefutable evidence of blockchain being a secure technology. Two fundamental elements of blockchain are transactions of the users and blocks that use timestamp protocol to record these transactions in the correct sequence. This database cannot be changed, lest you pay a very high cost for altering previous records. Also, Blockchain is Byzantine fault tolerant. Now, how can Blockchain be leveraged to secure IoT? This distributed database can enable co-ordination between devices without the need to have a third-party message broker. It can keep a record of the messaging between smart devices, which would eliminate the need of a centralized authority for message passing and parsing. There is an optimum solution that is standardized, scalable, and secure. You get actionable insights from the stored data. There is a simpler mechanism for securing and integrating the huge amount of data. 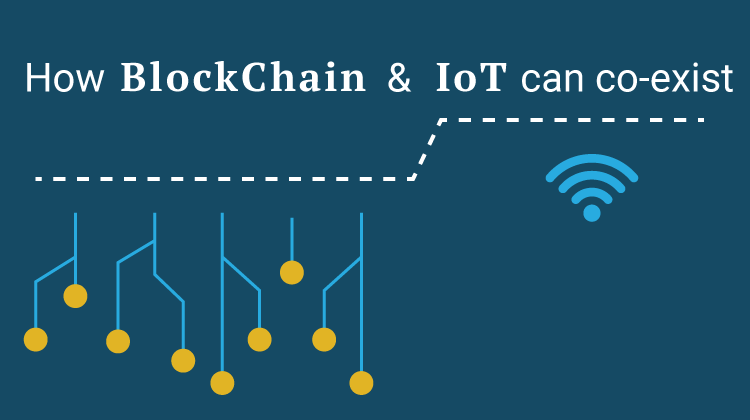 The challenges to implementing Blockchain for IoT include scalability – problem similar to that in the widespread adoption of cryptocurrency, lesser processing power and more time consumed, dearth of skilled personnel, and regulatory compliance issues. Barring these challenges, Blockchain IoT security will certainly make waves in foreseeable future. What are your views? Drop a line in the comments section below.